Battle of Carrhae (53 B.C.) 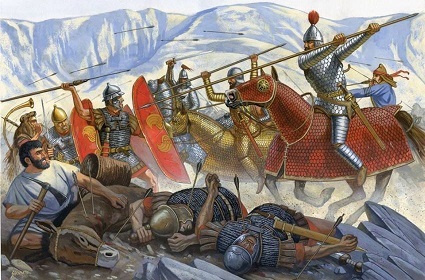 - The Battle of Carrhae was an ill-advised invasion of the Parthian Empire by Marcus Lucinius Crassus, the third member of the First Triumvirate. Crassus was the richest man in Rome, but his fame paled in comparison to that of both Caesar and Pompey who had achieved military glory. He wanted some glory of his own, so he used his money to raise an army and marched into Parthian territory. They met the enemy at a town called Carrhae. The Roman army was woefully unprepared for the Parthian horse archers and was badly beaten.